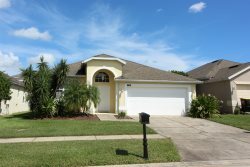 Encantada Resort is a family-friendly gated community just off HWY192, just a few minutes from Disney's doorstep in Kissimmee, Florida and is perfectly placed for the shops, restaurants, fun and attractions that Orlando has to offer. With 3 bedrooms and 3 bathrooms, this fully air-conditioned, family friendly vacation home is perfect for families or for a few friends golfing or vacationing. There is a main floor bedroom and bathroom, making this villa accessible to most! This Vacation Home has a spacious family room to relax in during the day or evening, with a luxurious queen size sleeper sofa, flat screen cable TV, and WiFi. Step from the family room into the spacious Dining room and visit with family while enjoying a great meal prepared in your own fully equipped kitchen. The open floor plan is a great space to eat and relax with friends and family. The kitchen has been equipped with everything that you could need to provide a family feast to enjoy together. There is a full sized washer and dryer. Luxurious sleeping accommodation awaits you when you stay at Encantada Vacation home with 3 bright and roomy bedrooms. There is a King, a queen and a room with two twins, each with its own bathroom. Make use of the huge, zero entry community pool and 2 spas, in addition to your own private pool. Let the kids frolic the awesome playground. The 9000 sq. ft. clubhouse has a well equipped fitness room, just in case you can squeeze some exercise into your vacation time! Take a walk on the paved pathways to enjoy the grounds, beautifully lush with trees and gardens, as well as a lovely lake and gazebo area. Take advantage of the clubhouse cafe bar for snacks and drinks. If you need anything, you can get it 24 hours a day with an open reception area and welcoming staff. Get free Wi-Fi, let the kids enjoy the game room, play pool, enjoy the playground, or go for a jog around the lake, complete with pier and catch-and-release fishing. This Encantada Resort Vacation Home is truly an executive property with over 1100 square feet of luxury and a delight that you will want to enjoy again and again.